Objective: Despite the popularity of cricket at the junior community level, few studies have described injuries for this level of play. This study describes the epidemiology of cricket injuries in junior club cricket across three playing seasons to identify priorities for prevention. Design: Prospective on-field injury data collection during match observation of acute injuries. Pre and post observational evaluation of mandatory helmet wearing. Setting: The Sutherland Shire Junior Cricket Association, New South Wales, Australia during the 2002–03, 2003–04 and 2004–05 playing seasons. Participants: All junior teams (Under 8 (U8)–U16). Intervention: Compulsory headgear introduced for all batters before the 2004–05 season. Main outcome measures: Frequency of injury according to age level, grade of play and playing position, and injury rates per 100 registered players. Results: 155 injuries were reported. No U8 player sustained an injury, and injury frequency increased with age. Traditional cricket was associated with more injuries than modified cricket. At each age level, the most skilled players had the lowest frequency of injury. Overall, batting accounted for 49% of all injuries and 29% occurred when fielding; contact with a moving ball was responsible for 55% of injuries. 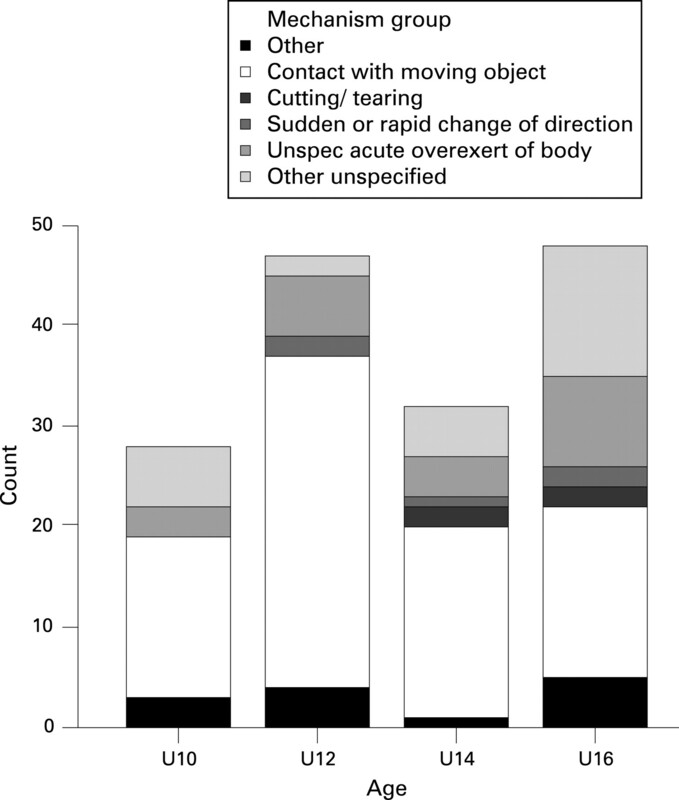 The most commonly injured body region was the face (20%), followed by the hand (14%). In batters, the frequency of head/neck/facial injuries fell from 62% in 2002/03 to 35% in 2003–04 to just 4% in 2004–05 after headgear use was compulsory. Conclusions: Injury rates in junior players are low, but increase with age and level of play. Use of protective headgear, particularly by batters, leads to a significant reduction in injuries. Sports injuries are a significant public health issue and have been identified as a priority for prevention and control.1 2 To inform the development and implementation of appropriate prevention initiatives, the magnitude of the sports injury problem needs first to be defined and potential injury risk factors identified.3 This is particularly important for sports that are both popular and associated with a risk of injury, such as cricket. One of the few studies describing injuries in young cricketers was conducted in South Africa and involved a self-reported survey of 116 schoolboy cricketers.8 Injuries were relatively common (49 per 100 players per season) and often prevented junior cricketers from completing a match or training session. Injuries were mainly to the back/trunk (33%, predominantly muscle and ligament injuries), upper limbs (25%, mainly involving the fingers, due to being struck by the ball) and the head/neck/face (19%, predominantly impact injuries while batting). The only other published study of injuries in junior cricketers investigated 44 high-performance junior fast bowlers over a season and found that 25% of the group sustained an overuse injury.10 Injured bowlers had been bowling significantly more often than uninjured bowlers, suggesting that high bowling workload is a risk factor for overuse injury to junior fast bowlers. Cricket is also associated with many contact or acute injuries,9–13 which are most common during low-level competition, junior games or informal participation.9 Because of the potential severity of impacts associated with the hard ball, a range of protective equipment has become a common feature of standard cricket equipment.9 In recent years, many junior cricket associations in Australia have introduced compulsory wearing of protective headgear for all junior batters. However, there has been no previous field-based study of the effectiveness of protective headgear in junior cricket. The aim of this study was to provide a description of the most common injuries and their mechanism in junior club cricket over three consecutive playing seasons and to assess the effect of compulsory headgear use on injury frequency both overall and specifically in batters. Injury data were collected from all junior clubs participating in the Sutherland Shire Junior Cricket Association (SSJCA), New South Wales, Australia. All teams from the under-8 years (U8), U10, U12, U14 and U16 levels were included for the seasons 2002–2003 (1146 registered players), 2003–2004 (1261 registered players) and 2004–2005 (1215 registered players). All teams played a total of 10 matches, each being played over two consecutive weekends. Match scorers prospectively recorded the occurrence of all acute injuries (body region), their circumstances (player position, mechanism of injury) and injured player details (competition age group, type and grade of cricket). The data collection was initiated by the SSJCA and the data provided to us after the data collection period in the form of a de-identified Excel spreadsheet (Microsoft Corp., Redmond, Washington, USA). Data were pre-coded according to the Australian Sports Injury Data Dictionary14 and transferred to SPSS for Windows (SPSS Inc., Chicago, Illinois, USA) for analysis. It was not possible to derive participant or player hour adjusted injury rates because data were not concurrently collected on participation (or exposure). However, player registration numbers were obtained from the SSJCA. It was also not possible to determine if players received multiple injuries over the course of a season, thus each injury report was treated as a separate injury incident. All data are therefore presented as the frequency (%) of all injuries with 95% confidence intervals (95% CI), and χ2 tests were used to assess the differences in frequencies across groups. The SSJCA introduced mandatory headgear wearing for junior batters before the 2004–05 playing season and so an ecological (observational) analysis of the likely effect of this on injury rates was also undertaken by comparing injury rates per 100 registered players and their 95% confidence intervals, and the frequency of injuries in batters only, before and after this regulation. Overall, 155 injuries were reported over the three seasons. There was a significant association between level of play and injury, with injury frequency significantly increasing with age (p = 0.015). No U8 player sustained an injury, despite 7% of all registered players being this age. In contrast, 19% of players played U16 cricket but 31% (95% CI 24% to 38%) of all injuries were at this level. There was a significant association between injury frequency and grade of play (p<0.001). Grade A (the highest skill level at every age) had 30% of all registered players, but was associated with just 16% (95% CI 10% to 22%) of injuries. Almost half of all injuries (45%; 37% to 53%) were sustained by B grade cricketers, despite accounting for only 28% of registered players. There was a significant association between the frequency of injury and the type of cricket played (p<0.001). Traditional cricket accounted for 80% (95% CI 74%–86%) of all injuries but had only 69% of registered juniors. Conversely, introductory and preliminary cricket (combined) accounted for just 4% (1%–7%) of injuries with 16% of the registered players. Irrespective of grade, the primary cause of injury was contact with a moving object, accounting for 57–70% of all injuries in the U10–U14 groups and 35% (95% CI 22%–48%) of injuries in U16 players (fig 1). Figure 1 Mechanisms of injuries sustained by junior club cricketers according to level of play (there were no injuries to U8 players). Across all grades, batting accounted for 45–53% and fielding 24–32% of all injuries. There was a strong association between the mechanism of injury and the cricketing activity at the time of injury (p<0.001). All wicket-keeping injuries were due to contact with a moving object, compared with 65% (95% CI 54% to 76%) of batting, 47% (32% to 62%) of fielding and 50% (10 to 90%) of training injuries. More than half of bowling injuries (58%; 30% to 86%) and 33% (0% to 71%) of training injuries involved an unspecified acute overexertion of the body. The most commonly injured body site was the face (20%; 95% CI 14% to 26%), followed by the hand (14%; 9% to 19%). The lower limb accounted for 30% (23% to 37%) of all injuries, the head/neck/face for 27% (20% to 34%), the upper limb for 24% (17% to 31%) and the lower back/pelvis for 5% (2% to 8%); lower back/pelvis injuries were most common in U16 players. There was a strong relationship between the injured body regions and the activity at the time of injury. Two-thirds (67%) of all wicket-keeping injuries were to the face or head compared with 50% (10% to 90%) of training injuries and 28% (19% to 37%) of batting injuries. Among fielders, 33% (19% to 47%) of all injuries were to the hand and 24% (12% to 36%) to the knee. The overall rates of injury per 100 registered players, are shown in fig 2. The injury rate in 2004–05 was less than that in the previous 2 years, but this was not significant. There was a significant association between the activity when injured and the playing season (p = 0.021). In 2002–03, 62% (95% CI 58%–69%) of the injuries were sustained when batting. In 2004–05, after compulsory headgear had been introduced this was reduced to 36% (32%–40%). Figure 2 Comparison of overall injury rates per 100 registered junior club cricketers across playing seasons. Figure 3 shows the overall body region distribution of cricket injuries across playing seasons. 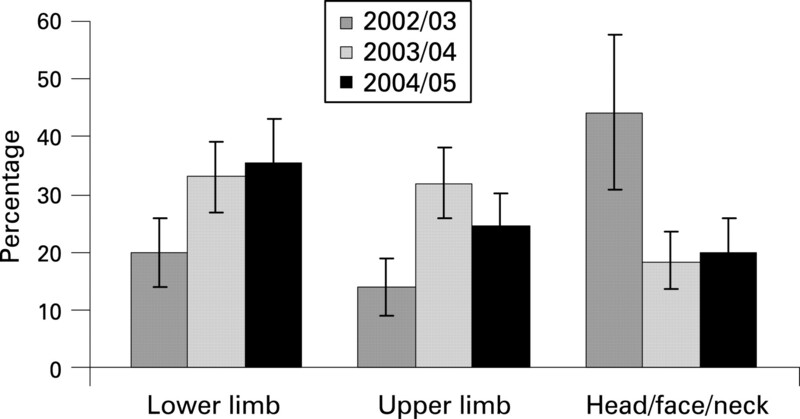 In 2002–03, the most common injuries were to the head/neck/face and in the following seasons, it was the lower limb. There was a significant reduction in the frequency of head/neck/face injury in the 2003–04 and 2004–05 playing seasons, relative to 2002–03. When the analysis was restricted to batters, the group most targeted by compulsory headgear, it was found that the frequency of injuries sustained to the head/neck/face declined significantly from 62% (95% CI 49%–76%) in 2002–03 to 35% (22%–48%) in 2003–04 and just 4% (0%–9%) in 2004–05, after compulsory headgear was introduced. Figure 3 Effect of compulsory helmet wearing, introduced before the 2004–05 season, on the distribution of injuries in junior club cricketers. Although a few studies have examined risk factors for junior injury, particularly among fast bowlers,10 11 this study is, to our knowledge, the first report of injuries to junior club cricketers outside of South Africa.8 It provides a profile of injuries sustained by junior club players and an observational, ecological assessment of the likely effect of a helmet-wearing regulation for batters. As the injury data were collected within only one cricket association, it is not clear if the results could be extrapolated to other associations and leagues. Nonetheless, the implications for the preventability of cricket injuries in junior players are likely to be universal. Modified rules have been introduced in several sports to increase participation rates, promote skills and decrease injuries in children. Compared with the adult form of the game, modified cricket uses lighter balls, the distance between wickets is shorter and the number of allowable overs is reduced.9 11 In this study, no injuries were sustained by U8 cricketers, who play preliminary cricket, a highly modified form of the game. The higher frequency of injuries in U16 players is likely to be related to the fact that traditional cricket is played by these players. Traditional cricket accounted for 20 times as many injuries as introductory and preliminary cricket combined. Together, these findings suggest that the more modified forms of the game are effective in promoting safe cricket, although this would need to be confirmed in a more formal comparative study of same age players. Contact with a moving object (most likely the ball) was the primary mechanism of injury, suggesting that the most important protective measure is likely to be protective equipment. Unfortunately, it was not known what protective equipment was worn by the players, other than that it was compulsory for batters to wear headgear in the last season. Although it would be expected that all wicket keepers and batsmen wore gloves, this could not be confirmed with the data available to us. Fielding was also a common context of injuries and such injuries are most likely to be related to catching, or miscatching, the ball. This suggests that junior cricketers may require more skill development in how to catch a ball, in order to avoid injury. The hand was the second most commonly injured body region, reflecting the nature of cricket as being a throwing/catching game, again emphasising the importance of coaches helping players to develop ball-handling skills during training. There is a risk of both acute and overuse injuries in junior cricketers. However, the magnitude of this risk and distribution of acute injuries is largely unknown in junior club cricketers. The use of protective equipment, such as headgear, is likely to reduce the risk of acute injuries resulting from impacts from a cricket ball. The injury rates quantified in this study of junior club cricketers are low but increase with age and level of play. Use of protective headgear, particularly by batters, leads to a significant reduction in the frequency of head/neck facial injury in junior club cricketers. A key finding of this study was the reduced rate of head/neck/facial injuries overall, and in batters more strikingly, in the last season compared with the two earlier seasons. The most likely explanation for this is the introduction of compulsory headgear before the 2004–05 season. The overall rate of head/neck/facial injuries in the 2003–04 season was not significantly different to that after the introduction of compulsory headgear, and is likely to reflect the fact that some players did wear headgear during that season, before it was made compulsory. Unfortunately, our evaluation of reduced injury frequency was not controlled and, as an ecological study, may be due to bias or confounding. However, the magnitude of the reduction in batters, the players specifically targeted by compulsory headgear, from 62% (2002–03) to 35% (2003–04) to 4% (2004–05), is so large that it is unlikely to be due to chance alone, suggesting that the protective effect is real. It is recommended that a formal controlled evaluation of the effectiveness of cricket headgear is undertaken to confirm these findings before widespread adoption of compulsory headgear. The finding that two-thirds of wicket-keeping injuries were also to the head or face indicates that consideration should also be given towards headgear use by these players. As at least some of the head/neck/facial injuries occur during training, consideration should be given to ensuring players wear helmets when practising their batting skills in nets. It was not possible to compare our injury data directly with that across different levels of the sport because of the limitations in the data collection. The data were collected prospectively by a cricket association for their monitoring purposes and this collection did not include collection of exposure time at risk. This meant that injury incidence rates taking the exposure time at risk into account could not be calculated, or the time away from the sport as a result of the injury monitored. We also could not determine the severity of the injuries because this information was not collected. Furthermore, the lack of a formal injury surveillance process, and involvement of often untrained game scorers, meant that full injury details were not always recorded and this led to the relatively large proportions of cases assigned to non-specific categories such as “Unspecified acute overexertion”. There is no doubt that more rigorous and continuous injury surveillance is warranted for community level cricket to identify risk factors, and to implement and evaluate prevention strategies. Whether or not injury surveillance guidelines for the international level of the sport16 are also useful for the junior level is yet to be determined but should be the consideration of future research. Our study has shown that the rate of injury in community junior club cricket is low. Modifications to the game appear to be working to reduce the incidence of injuries in younger players. As the most skilled players had the fewest injuries, it would be useful for lower-grade players to also improve their technical and ball-handling skills and tactical play and to undergo more sports specific training, so they are better prepared for match play. Coaches may need further education about on specific conditioning programmes and game development strategies for different on-field activities, particularly for ball-handling skills, appropriate for junior cricketers. The higher incidence of lower back injuries among the U16s requires further investigation, and coaches, parents and players should all be made aware about the potential detrimental effects of high bowling workload. Finally, and most importantly, this study provides evidence that suggest that introduction of compulsory helmet wearing by batters is likely to reduce the number of injuries to these players. L Shaw conducted this study as part of her Master of Public Health Studies at the University of New South Wales. C Finch was supported by an NHMRC Principal Research Fellowship. The Southern Sydney Junior Cricket Association (SSJCA) provided the data. We thank T Croucher from the SSJCA and Dr R Dennis from UNSW for their contributions to this project. Department of Health and Ageing. Sports safety in Australia. An update. July 2003. Canberra: AGDHA, 2004.
. SportSafe Australia: A national sports safety framework. A report prepared for the Australian Sports Injury Prevention Taskforce. Canberra: Australian Sports Commission, 1997.
. A new framework for research leading to sports injury prevention. J Sci Med Sport2006;9:3–9 .
. Injuries in Australian cricket at first class level 1995/1996 to 2000/2001. Br J Sports Med 2002;36:270–5 .
. Back injuries and the fast bowler in cricket. J Sports Sci 2000;18:983–91 .
. The incidence and nature of injuries in first-league and provincial cricketers. S Afr Med J 1992;83:339–42 .
. The relationship between fast bowling workload and injury in first-class cricketers: a pilot study. J Sci Med Sport 2004;7:232–6 .
. The seasonal incidence and nature of injuries in schoolboy cricketers. S Afr Med J 1995;85:1182–4 .
. Measures to prevent cricket injuries. An overview. Sports Med 1999;28:263–72 .
. Is bowling workload a risk factor for injury to Australian junior cricket fast bowlers? Br J Sports Med 2005;39:843–6 .
. The effect of altered pitch length on performance and technique in junior fast bowlers. J Sports Sci 2005;23:661–7 .
. Sport and active recreation injuries in Australia: evidence from emergency department presentations. Br J Sports Med 1998;32:220–5 .
. Hospitalised sport/leisure injury, Australia 2002–03. Adelaide: Australian Institute of Health and Welfare, 2004. Australian Sports Injury Data Working Party. Australian Sports Injury Data Dictionary: guidelines for injury data collection and classification for the prevention and control of injury in sport and recreation. Canberra: SportSafe Australia (Australian Sports Commission) and Sports Medicine Australia, 1998.
. Bowling workload and the risk of injury in elite cricket fast bowlers. J Sci Med Sport 2003;6:359–67 .
. Methods for injury surveillance in international cricket. J Sci Med Sport 2005;8:1–14 .